In this new eConsent video, industry expert, Sandra "SAM" Sather, explains how the localisation process is easier to implement in an electronic informed consent (eConsent), and what study teams should consider as they design their eConsent solution. Sandra "SAM" Sather’s current focus of consulting is to promote clinical quality systems for Sponsors/CROs and Investigators/Research Institutions. She has over 30 years of clinical experience, has a Bachelor of Science degree in Nursing and a Master of Science degree in Education with a Specialization in Training and Performance Improvement. SAM has been dual certified by the Association for Clinical Research Professionals (ACRP) for over 10 years as a CCRA and CCRC. She is a current member of the ACRP Academy Board of Trustees, and ACRP Regulatory Affairs Committee (RAC); SAM has been a clinical research coordinator, site manager, sponsor and CRO monitor, auditor, trainer and quality manager. She has multiple training, monitoring and project management experiences of diverse size, and objectives with a variety of global clients. She is a frequent speaker at industry conferences and has authored dozens of courses for clinical research training programs. In 2002 she co-founded Clinical Pathways (CP), LLC. 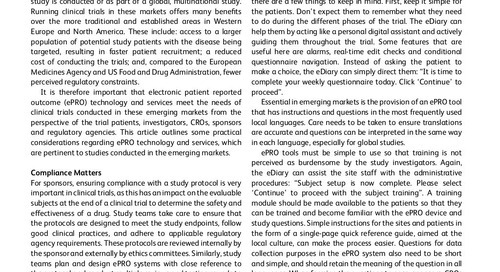 When implementing electronic informed consent in a multi-centre trial that’s global, one of the considerations is translations. So when—just like when you’re planning any study, and informed consent or any other kind of subject specific documents that they’ll be receiving, we have to plan for translating that into the language that they understand. We know that the regulations require that we have translations. So when it comes to paper, we as an industry really know that process very well, and we have translation companies. So what we’ve done as an industry for electronic informed consent, we’ve used the knowledge and the expertise of our translation companies, and/or the ones that the sponsor are using, and then involve them in the development of the electronic informed consent. So commonly, we develop an electronic informed consent in a primary language, and then from that, understanding for what sites will be allowed or ah approved to have different translations, really plan for that as early as possible. 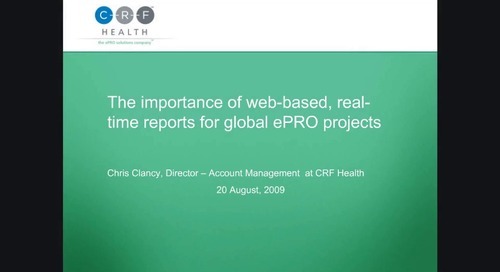 And in some systems, like CRF Health’s system, the translation company can work right within our design tool, our development tool, instead of having to do the laborious translation of the paper and then having to put it into the electronic consent and having, you know, re-certifications and re-reviews from IRBs several times, we can do it up front. Another consideration that’s really important for translation is there’s additional things you need to translate in eConsent. It’s the navigation. So you wouldn’t want English navigation so much if everything else is Spanish, and they don’t understand English. Or audio. Think about the audio that we need to make sure that we’re back-checking, that the— not just the text and the notes, but actually what somebody was saying met and matched. Just like paper there’s certain words that probably don’t translate or concepts back and forth. So the same challenges and managing those would be the same thing like paper. So there’s some similarities but there’s definitely some additions that you need to plan for. Ah, one other thing about translations. 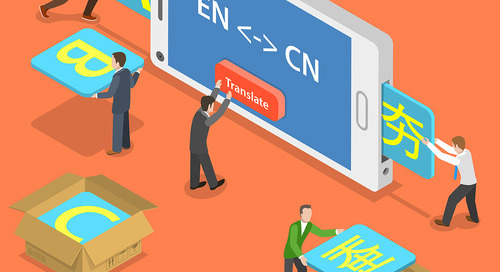 A company that has the experience of working with translations is critical, especially because it’s not again just the content, where we rely a lot on our translation specialist and companies and vendors. It’s really knowing how to design something in multiple languages. Like the navigation. Ah, the tutorial. Ah, so these are things that CRF Health has done for years with the eCOA space. 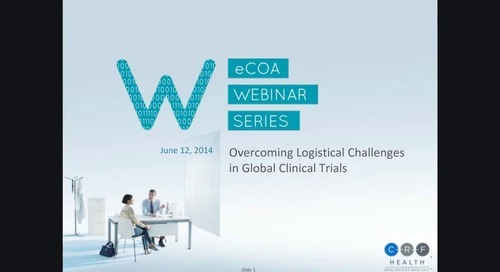 Deploying eCOA in a global clinical study requires a reliable supply chain, as well as an understanding of trade protocols for individual countries as they relate to importation of electronic devices. 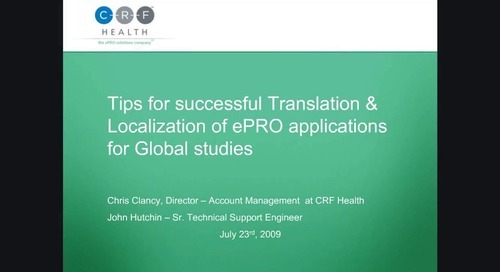 Chris Clancy and John Hutchin discuss localization and translation in global clinical trials, provid-ing guidance on streamlining processes to stay ahead of study timelines. Recorded July 23, 2009. Kristina Ernberg discusses technical, logistical, cultural, linguistic, and regulatory challenges of deploying ePRO globally and how to overcome them while mitigating risk. Recorded October 25, 2010. 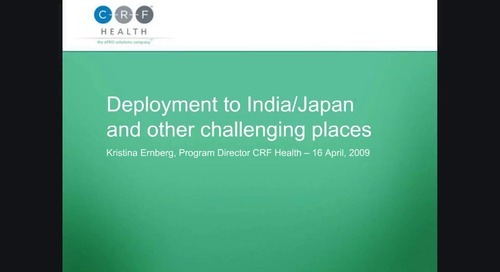 Kristina Ernberg looks at clinical trial case studies from several countries to explore challenges specific to certain geographical areas and identify ways of overcoming them. Recorded April 16, 2009.